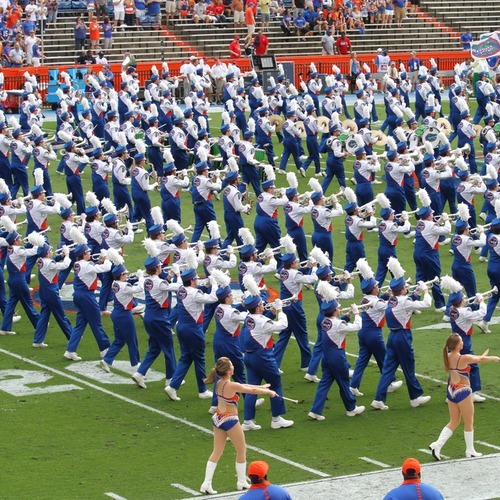 Did U know…UF students get in FREE to all Gator athletic events, other than football, with their Gator1 ID Card. Regular season events for these sports are free and open to the public. Golf, Lacrosse, Soccer, Swimming & Diving, Tennis, Track & Field. Students who do not pay the UF athletic and activity fee are not eligible for student tickets. UF is a part of the Southeastern Conference (SEC) and participates in almost every collegiate sport including football, basketball, baseball, volleyball, swimming, gymnastics, lacrosse and soccer. The Gators are considered to be an elite program with three national football championships and numerous division championships. The Gators play at Ben Hill Griffin Stadium better known as The Swamp. The official seating capacity is 88,548, although the actual attendance regularly exceeds 90,000. It is considered to be one of the loudest and toughest home stadiums for opponents. With a large and loyal alumni base and strong student support, the excitement of Game-days builds rapidly depending on the start time. There are RV areas with alumni starting to tailgate hours before each game. Students line University Avenue to watch and support the Gators during the official Gator Walk. The football team and coaches come out 2 hours and 25 minutes prior to kickoff at the north end of the stadium and walk the line of fans as they make their way to the locker room. 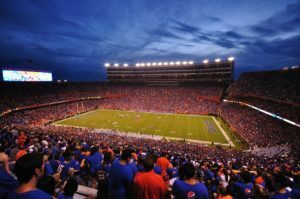 The University Athletic Association has recently partnered with the outside company, Tailgate Guys to This company provides Gator fans with a turnkey tailgate experience. This includes everything needed for a tailgate including tents, tables, chairs, full television packages all set up on the Reitz Union lawn, steps away from the stadium. Options are also available for ice-filled coolers, paper products, utensils and choices for full-service catering. Students can purchase season tickets on a first come first serve basis. 2015 was the first year in many years that sales did not rely on a lottery system but with the Gators having a successful season, they may go back to that system depending upon the demand. Non-students may not use student tickets as entry does require showing your student ID. They are pretty strict about entrance with a valid student ID. Alumni have the opportunity to purchase season and single day tickets. If you are coming in to visit your student and are not an alumnus, there are several options. You can purchase tickets on the official website providing it is not a sold out game. You can purchase through a reputable third-party ticket broker or you can purchase a student ticket and upgrade it at the box office. The charge to do that varies depending on the game but can be upwards of $50.00 so you need to be careful how much you are paying in total. There are many scalpers roaming around the stadium prior to the game but oftentimes they are asking not only for a large markup on the face value of the ticket but you never know if it is a legitimate ticket. If you choose to take that chance, it is recommended you know the full layout of the stadium because you may end up buying tickets in the very last row of the stadium (the last row is different depending on where your ticket is). Just this past year, I risked purchasing tickets for a strong rivalry game. I paid $80 for the ticket which was the face value and was assured the seats were in the shade and not that high up. As I could not pull up the stadium seating chart because it is sometimes difficult to get service, I took a chance. It was an afternoon game and I was so annoyed to learn as I made my way to the seats that not only was it the very last row of the stadium but I was surrounded by the visiting team fans and sitting in a section where the sun blazed won for the entire game. I ended up going online to buy new tickets through a third party site for about $40 more than what I paid. These seats were on the 50-yard line, 20 rows up; something I should have done from the get-go if I was willing to spend that much money. The Swamp is a tobacco-free stadium. For the first time, beer and wine sales has been added to the premium seating lounge areas and sales will end at the start of the third quarter in football, and at the start of the second half in men’s basketball. Fans purchasing alcohol in the premium areas must consume their drinks in the lounge and cannot take any alcohol to the general-seating area. They do have concessions that sell water, soda and ice tea and lemonade for all other seating. On extremely hot days, they will sometimes allow the fans to bring in one empty water bottle and use the bottle refill fountains throughout the stadium. They will also utilize water-misting areas all to keep fans safe and cool. As mentioned above, demand for hotels is extremely high during football weekends, especially the strong rivalry games and homecoming. Try to book as far in advance as possible. Many hotels require you to cancel 30 days out during these weekends (normally you can cancel 24 hours in advance).